So, if you happened to see my shopping trip from earlier this week, you’ll know I stocked up on peppers and green onions at a great price! Some of those peppers went into the Oven-Baked Chicken Fajita freezer meals. But I bought more than necessary for just that recipe because I like to keep sliced peppers (and sliced green onions) in my freezer! I don’t use them often enough on a regular basis to keep them around as a produce staple, but I also hate paying nearly $2 per pepper just to make a recipe on a whim. Enter the magic freezer! 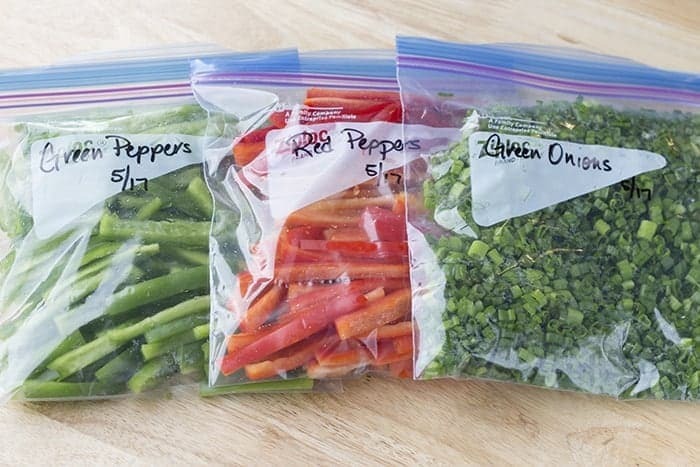 I buy peppers and green onions when they are on a great sale, and I chop or slice them and freeze them in bags. That way I get the savings of having bought the produce on a great sale, but I don’t have to use all that produce right after I buy it! Savings win, right? But what do you do with all the end portions of your peppers? You throw them out or put them down the garbage disposal, right? NOOOO!!! You put them in a bag and freeze them. Why? Because they are perfect for making your own vegetable stock!! You can put pepper ends, onion ends, carrot ends, celery ends, etc. 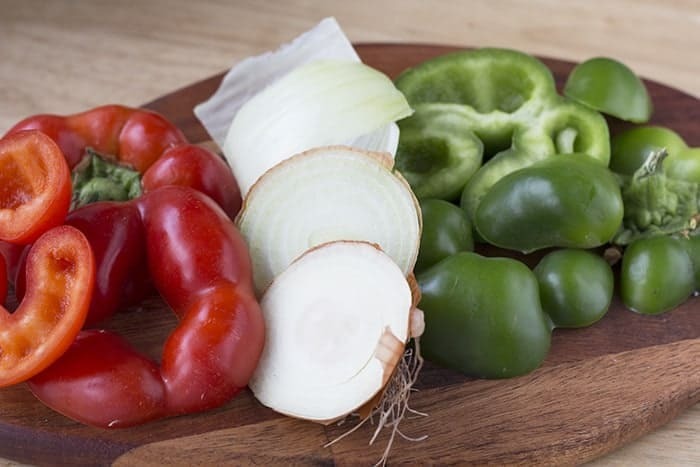 Then when you get a full bag, toss them into a pot with some water and seasonings, and in no time flat you’ll have your own homemade vegetable stock. From ends that would otherwise have gone to waste. Double save! And what do you do with the unused ends of your green onions? You toss them, right? NOOOOOO!! 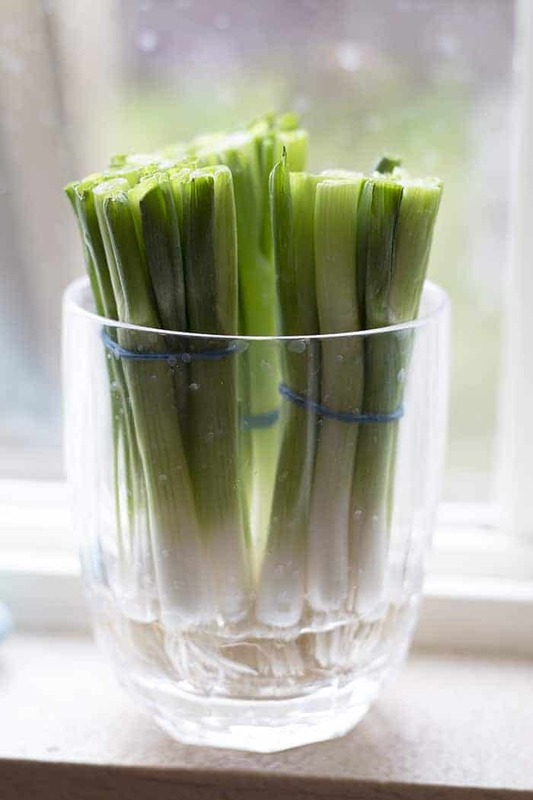 You can regrow your green onions from those ends! Place them upright in a glass of water (not too much, just enough to cover the roots) in the sun, and they will grow you all new tops! Which you can then cut and add to your freezer stash!! I’ve done as many as three rounds on the same root bulbs before. And they grow fast, so it doesn’t take very long to get more green onions. Great site and tips. My peppers always spoil before I get to end. 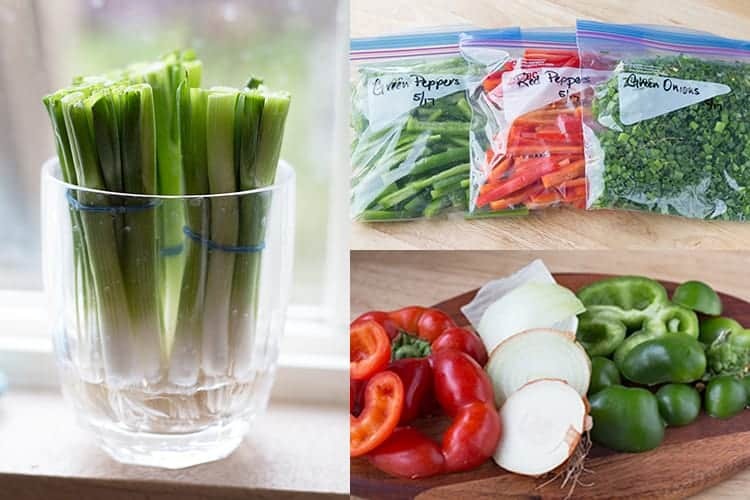 So I am going to go cut them up and freeze them and do the same with my green onions. With the price of everything Thou Shalt Not Waste is perfect.